Heavy duty feather edge fence panels (AKA close board, or vertical board fence panels) are available with arched, dished, or flat tops. 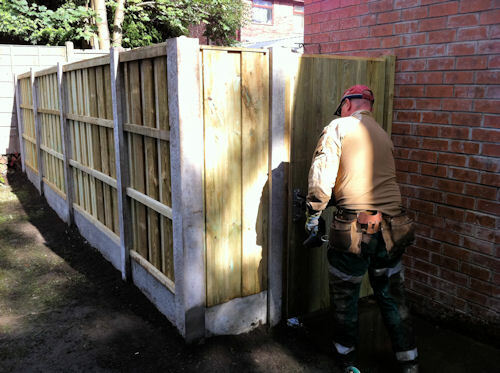 Our work is always guaranteed, fence posts ALWAYS CONCRETED, and we offer FREE QUOTATIONS to supply and fit concrete with waney lap or feather edge panel fencing. 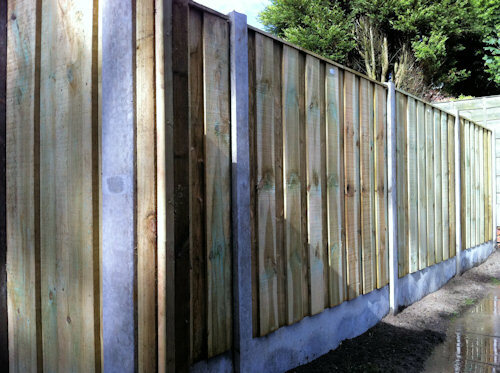 waneylap fence panels (AKA log lap or waney board panels). Waney lap garden fence panels are available with arched, dished, or flat tops. Concrete base panels are smooth or stone effect. Call for a FREE QUOTE in Bolton, Bury, Salford, Manchester, Horwich, Westhaughton, Walkden, Worsley or any surrounding area. These double vertical board fence panels are available in this light tanalised colour or traditional Brown. Sometimes called Turret panels, these are an incredibly heavy duty and durable alternative if you're looking for something different to the conventional feather edge or waney fence panels.